We are the Cal Poly Underwater Remotely Operated Vehicle (UROV/ROV) team. Come talk to our team anytime on saturdays in building 197 room 102. Coming from mixed majors and backgrounds, we are building a task-based vehicle for both competition and research in aquatic environments. The international MATE competition is held in a different location each year. In the past, our team has competed in Houston, Texas (2016) and St. John's, NL, Canada (2015). Students from all over the world compete in this international collegiate level competition to learn about submersible technology and gain experience that guides them toward the technical marine workforce. This summer it will take place in King County, Washington from June 21st through 23rd. This iteration of the competition challenges us and our robot in the fields of maritime archaeology, seismology and renewable energy. More information about the competition can be found at the Marine Advanced Technology Education website. 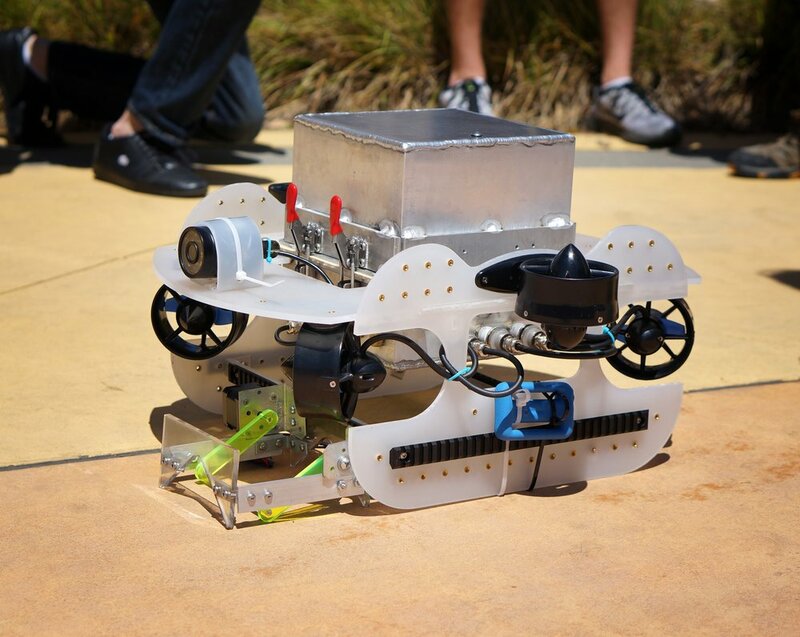 Our 2015 ROV performing its qualifier for competition.